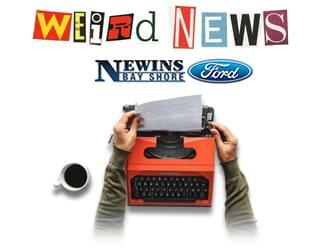 Home » Blog Index » Featured, Jim Douglas Mornings, Weird News » Can you please pass that 24-foot bottle of Ranch Dressing? Can you please pass that 24-foot bottle of Ranch Dressing? Jim Zygmont, of Trumbull, Connecticut, recently won two lottery jackpots within 5 minutes. He tells Connecticut Lottery officials; “I bought the first ’20X’ ticket over the counter at 4:56pm and won $20,000. Not even five minutes later, the store owner pointed out the Lottery’s new vending machine. He said, ‘They just started the machine up today; you should give it a try.’ I did and won another 20 grand. Fox News claims Hidden Valley Ranch is celebrating National Ranch Day this Sunday by bringing a 24-foot bottle of ranch dressing to the Las Vegas Strip. Ranch dressing fans are encouraged to fill up any size container for free. The company says; “If you can carry it, Hidden Valley Ranch will fill it”. Hidden Valley is expecting people to show with coolers and kiddie pools!